LeBron drops eight points total in crucial game five: We await ESPN’s reaction. Waking up this morning and checking your iPhone, HTC, iPad, laptop, tablet, smoke signals or whatever it is you use to stay plugged into the Zeitgeist, seeing LeBron James was sitting on eight points in the crunch Miami/Dallas game, you would absolutely have been forgiven for rubbing your weary eyes and melting back in to bed in the belief it was still 4 am Irish time and the game was in the second quarter. However, no, that was his actual output for the entire game. That’s right. Eight points. And no, despite what ESPN might have you believe, LeBron points don’t count double. It will be very interesting to see how the sports media giant spins this one, you know, considering they are not allowed say anything bad about The K$ng. On the plus side, at least LeBron is going to be seriously well rested before game five, seeing as he basically took game four off. Cleveland fans all over the World are wincing as they remember LeBron coasting through his last Cavaliers playoff series against Boston. He was anonymous then, and he was anonymous last night. Eight points? Big Dirk Nowitzki had an eight points before eight minutes had elapsed. Big Dirk rolled out of bed this morning and scored eight points. The lowest ouput the great Michael Jordan ever submitted in an NBA playoff game was 22 points. Maybe we are going to hard on LeBron. How on earth is he supposed to get his practice time in with all the side projects he has going on? The interesting author Malcolm Gladwell writes in ‘Outliers’ that most brilliant athletes have one thing in common, 10,000 hours practice at their given discipline. He wrote that researchers came to that figure after looking at the best of the best very closely. How the hell is LeBron supposed to get 10,000 practice hours clocked in? He has LeBron headphones, LeBron boxer shorts and LeBron label prophylactics to sell!! Then again, maybe we aren’t going hard enough on LeBron at all. The problem is, ESPN clearly has some manner of relationship with LeBron. Would you be shocked in any shape or form to log into ESPN and see a massive headline, ‘LeBron, greatest of all time? Probably!’ No you wouldn’t, right? 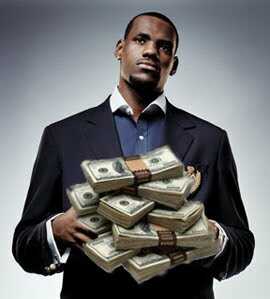 We will probably never know the business plan or money that is behind it, but for whatever reason ESPN has basically become LeBron’s propaganda machine. Or, one of them. 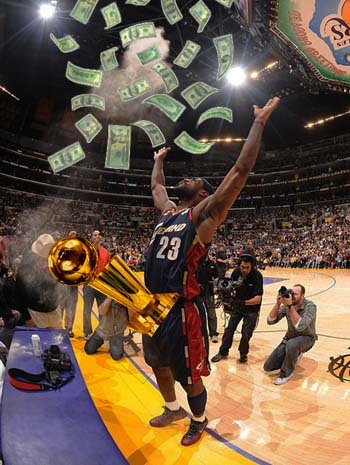 Twitter is always a fun place to be when whoever LeBron pays to ‘tweet’ is, well, ‘tweeting’. So here we are, wading through a decent NBA finals series, with ESPN roaring at us to appreciate how awesome a player is, how that player is amongst the games legendary greats and how we should appreciate this F.A.C.T or feel stupid. Meanwhile said player drops eight points in a pivotal game four. That’s the problem with life in this shallow, fast paced, Internet based World we have created. So much of the content of same is all bluster and no substance. So much of it is, ‘all talk’.